I love pasta, well, pretty much anything to do with pasta. 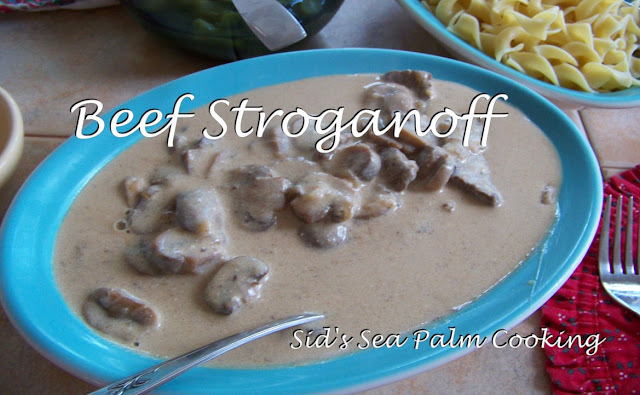 And when a friend mentioned they were making Beef Stroganoff for dinner the other night, my heart went pitter patter, and I 'knew' what was coming up in my menu rotation. As it happened I had a couple of small sirloin steaks in the freezer, they were part of a larger package I'd purchased that were, to put it politely, TOUGH. 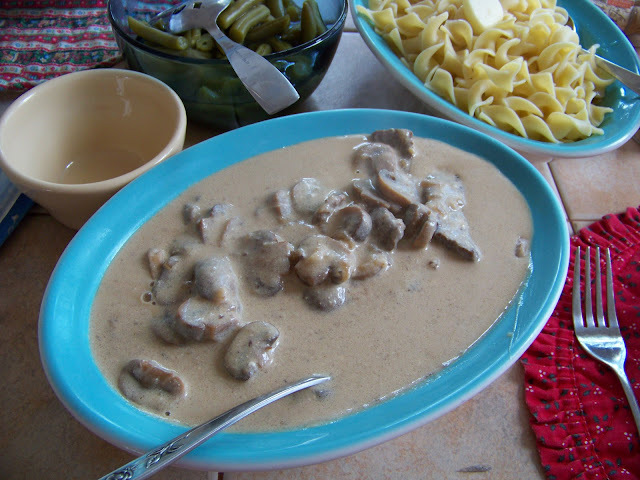 So I put the remainder in the freezer and thought I would save them to marinate or make into soup or ... Well, that proverbial light bulb went off again when Karen mentioned Beef Stroganoff, and I knew what I could use those little steaks for. I do cook for two people most of the time, and sometimes it's a challenge scaling down a recipe, but with the way I make this, you can expand the amount of meat and mushrooms or do as I did, make enough for two. To start with I sliced the mushrooms in thirds, approximately, I like a thicker slice for this dish, it seems to call for it. (by the way, adding some sliced portobello mushrooms and some crimini's instead of the meat, you've got a lovely vegetarian dish, just saying). Chop up about a third of a large onion and set that aside. 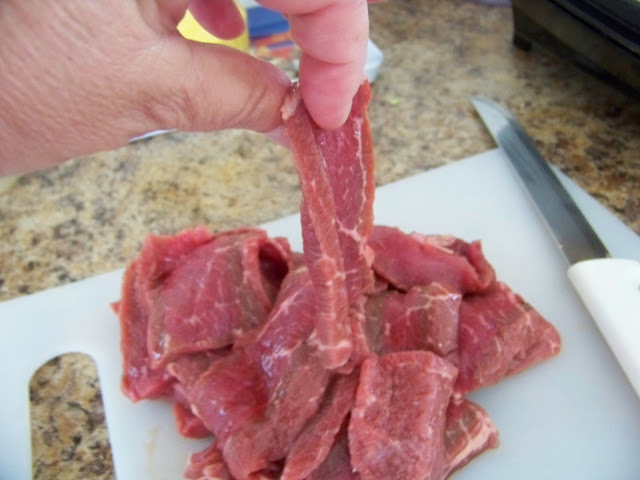 I then took the two lonely little 'tough' sirloin steaks and sliced them thin, on an angle. I wanted to make sure that they would brown quickly, and by cutting them at an angle, you also cut across some of the muscle fibers that toughen the meat. But don't worry if you don't do it this way, you will still simmer this for over an hour to help tenderize the meat. Add some butter to a pan, and get it nice and hot. Drizzle in a little olive oil if you like to keep it from getting too 'brown'. 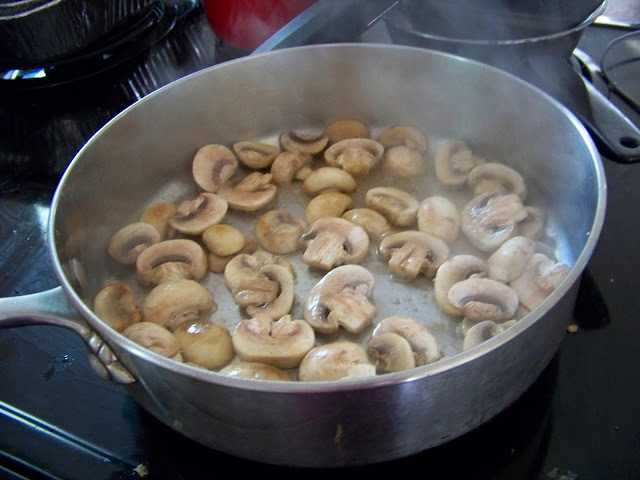 Add your mushrooms and let them cook a little, getting them brown, and as soon as they start releasing their moisture, dump them into another pan and let sit while you quick saute the onions in a little more butter. You just want them to be translucent and starting to brown, then dump them into the mushrooms and set aside. (I do this all in one pan, I like the layers of flavour that the different veggies and meat get). 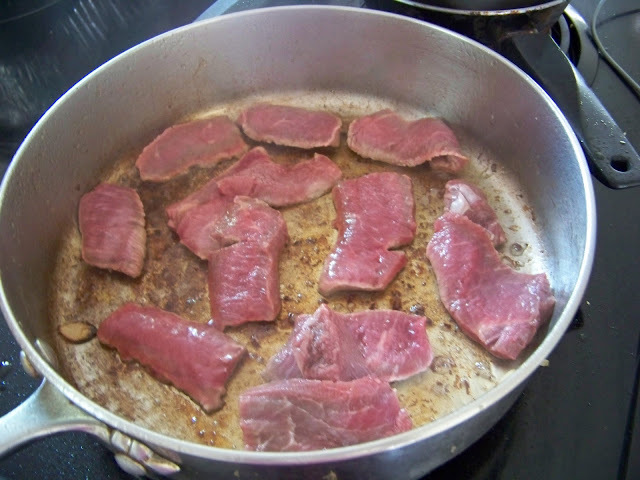 Add some olive oil or some coconut oil to the pan, and quick saute a little of the meat at a time. Just get it brown on one side and then turn and brown on the other side. Don't crowd the pan, please. As soon as the meat is browned, place in with the mushrooms and onions, and continue browning the meat till it's all browned. Then deglaze the pan with a little beef stock, about a cup to a cup and a half or so and put the veggies and meat back into the pan. Well, actually that's a misdirection, I very rarely have beef stock on hand so I make a 'quick and dirty' stock out of Au Jus mix, and yesterday I used about a half packet to about 1 1/2 cups of water. This way I don't add salt either, there seems to be sufficient salt in the Au Jus mix for our taste. Put the lid on the pan and let simmer for an hour or two. I simmered for about 1 1/2 hours and the meat was lovely and tender by that time. 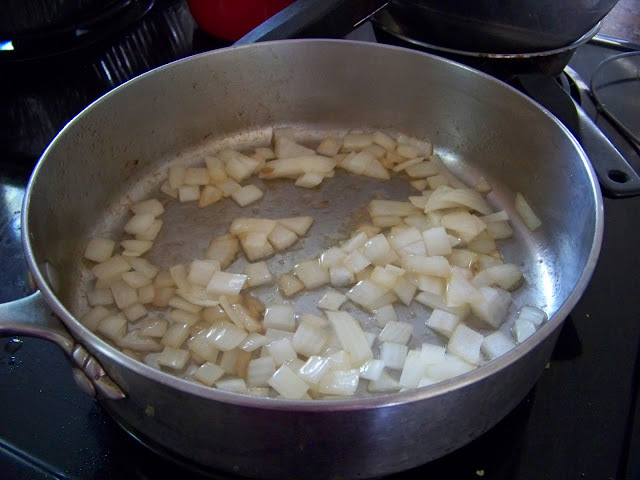 Remove the meat and veggies from the pan and set aside while you prepare the sauce. There should be about 1-2 cups of juice left in the pan, if you like you can add a little more water, but I would advise against it. 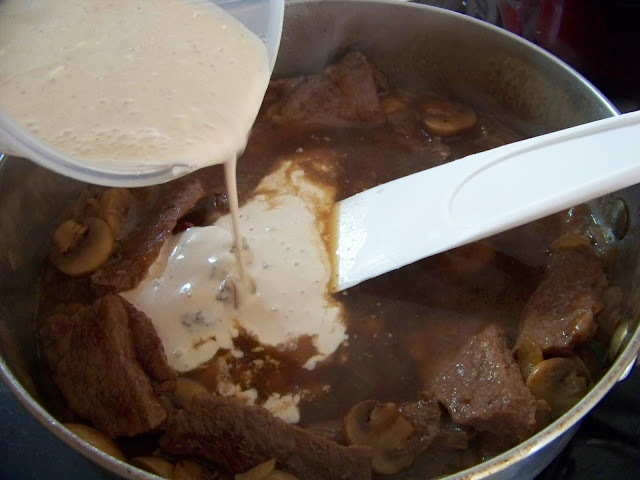 Add a little of the pan juice to the sour cream you have out and ready and waiting. You want to 'temper' the sour cream a little before adding it to the pan. Otherwise it curdles and looks yucky. And just before you add the 'tempered' sour cream mixture to the pan, stir in about 2 ounces of cream cheese. This helps to thicken the sauce and really adds to the tang of the gravy. Stir it all together and add back the meat/mushroom mixture and let it come up to temperature. Serve with egg noodles and enjoy. And by all means, don't forget the parsley you chopped up earlier and forgot to sprinkle on top to 'pretty' it up. We like a little sauce with our beef, as you can see here. 1 1/2 cup Water + more if needed. Saute the mushrooms and onions, set aside. 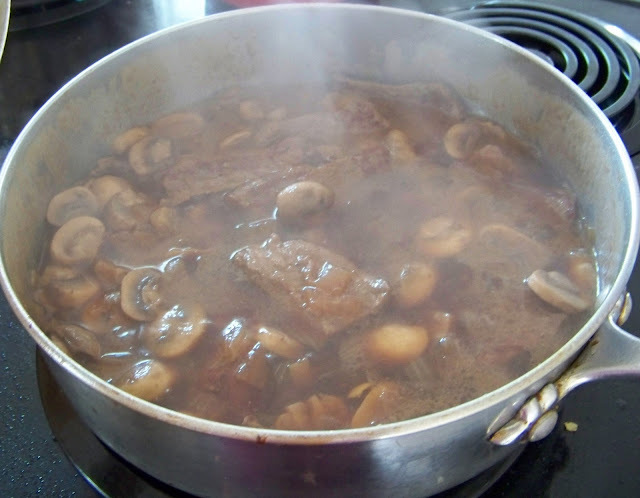 Saute the beef in small batches, when done, add the mushrooms, onions, Au Jus mix and water to the pot. Simmer over low heat for about 1 1/2 hours, or until meat is tender. Add more water if it is too dry. 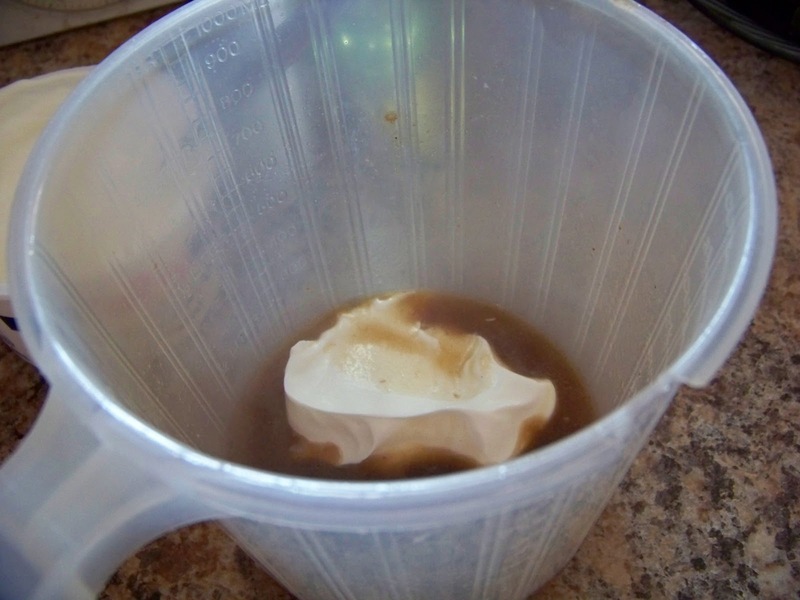 Then take out 1/ 2 cup of sauce, add the sour cream to it, this 'tempers' the cream so that it does not curdle. Stir the cream cheese into the meat/mushroom mixture and then add the tempered sour cream. Let it come up to temperature, and serve with some buttered noodles. I won't say this is a traditional Stroganoff, but I have to say, it's very good, and suits our tastes just fine. The dogs liked the leftover noodles as well. I always cook too many noodles. sigh. Looks like a delicious Beef Stroganoff, havn't had it in ages. We like it. My husband likes a lot of sauce so I make it so we have lots of sauce. I don't make it often, but, when I do we tend to eat the whole thing.